Ez Glam Gymnastic Air Floor Mat is an inflatable and tumbling product, that is designed for use at home, in the backyard, park, beach, grass and even on water. It is a very versatile mat that you can use for different types of training, in commercial and home gyms, dance clubs, cheerleading, pre-school gymnastics or on artistic gymnastics floor. Ez Glam is a very good quality product made of strong materials and components, like the solid commercial grade PVC tarpaulin and drop stitch (double wall) material. This model is much more airtight than the competition and all seams are properly reinforced to offer you more durability. It is an inflatable air tumbling mat that is simple to handle, inflate and deflate, fold and unfold. You can inflate or deflate it in just a few minutes without much effort. It maintains the optimal air pressure of as much as 5psi no matter what the external conditions are. After you inflate it, the air pressure will be maintained for several days. Unlike the foam mats, you can deflate this air mat for transporting and storage when you’re not using it and it will occupy very little space as deflated and folded. You will get a complimentary air pump in the box with your purchase, as well as a convenient carry bag so you can move it around easily. The air mat absorbs the impact much better than a foam mat. And it makes no noise when you’re working out or training. It is proven to be safer to use than other training equipment as the air ramp enhancing the recurrent periodicity. So you will be a lot less likely to get harmed or injured during your exercise session. It is a lightweight and practical fitness equipment that is designed to let you train anytime and anywhere you want, both indoors and outdoors. Being waterproof you can easily use it in a pool. It is very easy to install and inflate in just a few minutes and you may start using it straight away, without any delays. You can actually adjust the air pressure to your taste, between soft enough to bounce easily to very hard. The shipping weight is roughly 40 pounds and it is sent in double packaging with an inner handle bag covered by the thicker outer box. 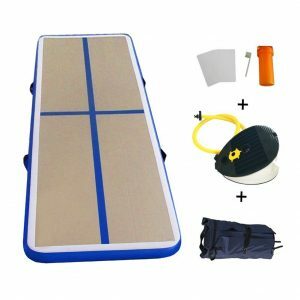 You will get the Air Floor Mat, foot air pump, canvas bag with a handle and a repair kit. You can get it in one of the four color options of red, pink, dark blue and light blue. Please make sure there is no sharp objects or fire near it when you’re using it.